Read this report as PDF. The problem of offshore tax avoidance by American corporations could grow much worse under President Donald Trump’s proposal to adopt a “territorial” tax system, which would exempt the offshore profits of American corporations from U.S. taxes. This change would increase the already substantial benefits American corporations obtain when they use accounting gimmicks to make their profits appear to be earned in a foreign country that has no corporate income tax or has one that is extremely low or easy to avoid. The one page of broadly outlined tax proposals released by the Trump administration in April included a line that read, “Territorial tax system to level the playing field for American companies.” No other details were provided about this part of the tax plan. Existing law already allows American corporations to “defer” (put off) paying U.S. taxes on profits they earn offshore until those profits are officially brought to the U.S. Deferral is a huge benefit because these profits can be held offshore (at least as an accounting matter) for decades or even forever, and no U.S. corporate income tax will be due so long as they remain offshore. American corporations have gone to great lengths to make their domestic profits appear to be earned offshore in order to obtain this benefit. American corporations would have even greater incentives to use these accounting gimmicks under a territorial system, which would exempt profits characterized as offshore profits from U.S. taxes. The exemption from U.S. taxes for offshore profits would be a much bigger tax break than the existing rule allowing deferral of these taxes. Contrary to the administration’s claim, a territorial tax system would not “level the playing field” for American corporations or for American workers. Taxes seem to have little effect on where corporations actually do business, but can have a significant effect on where they claim (to the I.R.S.) to do business. In other words, if the tax rules offer more favorable treatment for foreign profits than domestic profits, corporations will use various schemes in order to characterize their domestic profits as foreign profits. This problem in our current tax system would grow worse under a territorial system. To the extent that a territorial system would have a real impact on where American corporations actually locate operations and jobs, it would create incentives for corporations to locate them offshore rather than here in the United States. Proponents point out that other developed countries have territorial tax systems, but these proponents fail to note just how dysfunctional these tax systems have become as a result. Many governments have added special rules to prevent abuses of their territorial systems (which President Trump has not proposed). Even with those anti-abuse rules, their dysfunction has become so severe that it prompted the Organization for Economic Co-operation and Development (OECD) to spend years on a list of suggestions to make complex and convoluted rules to keep these territorial systems from collapsing altogether. We know that American corporations use several schemes to make their profits appear to be earned offshore because most of what American corporations report about the location of their foreign profits is mathematically impossible. For example, American corporations overall report to the I.R.S. that more than half of their offshore subsidiaries’ profits are earned in ten countries that are well-known tax havens. These are countries identified by the Government Accountability Office and/or the Congressional Research Service as common destinations for income shifted out of the U.S. In 2012, these ten countries together accounted for just 5 percent of the world’s gross domestic product (5 percent of the world’s economic output). And yet American corporations reported to the I.R.S. that 59 percent of the profits they earned through offshore subsidiaries were earned in these ten countries. Most of these are very small countries with tiny populations and few opportunities to do real business, like Bermuda, the Cayman Islands, the British Virgin Islands and the Bahamas. American corporations set up subsidiaries that are shell companies (often consisting of little more than a post office box) in these countries because they do not tax corporate profits. corporations to claim their profits are moving through them and then to one of the zero-tax countries. on paper. For example, the total profits that American corporations told the I.R.S. they earned in Bermuda in 2012 was $104.3 billion. This is impossible because the entire gross domestic product (the entire economic output) of Bermuda that year was only $5.5 billion. 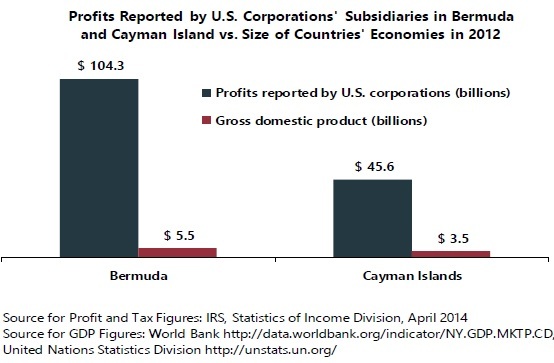 It is obviously impossible for American corporations to have profits in Bermuda that are eighteen times the size of that country’s entire economy. The same is true in the Cayman Islands, where American corporations reported a total of $45.6 billion in profits in 2012 even though the country’s GDP that year was only $3.5 billion. Under the current rules, American corporations are required to pay U.S. taxes on all these offshore profits when they officially repatriate them (when they officially bring these profits to the U.S.). There are many ways that corporations can delay repatriation and even get around the tax sometimes. But the territorial tax system proposed by Trump would provide a much bigger reward for this offshore profit-shifting because U.S. taxes would not be collected at all on profits that are characterized as offshore profits. Corporate spokespersons often complain that the “worldwide” tax system of the United States is unfair because it means the U.S. taxes profits that are not earned in the U.S. The truth is that our corporate tax system has serious problems that need to be fixed, but this is not one of them. The U.S. does, in theory, have a worldwide tax system, meaning the U.S. taxes all profits of an American corporation no matter where those profits are generated. But the federal tax rules allow corporations two breaks that allow foreign profits to go largely untaxed by the U.S. The first break is the foreign tax credit. When calculating their U.S. corporate income taxes, American corporations are allowed a credit for corporate income taxes they have paid to a foreign government. This sensibly prevents double-taxation of profits. The second break is often called “deferral.” The tax rules allow American corporations to defer paying taxes on the profits that they report to earn through their offshore subsidiaries, until those profits are repatriated (that is, until those profits are officially brought to the U.S.). But it can be difficult for the I.R.S. to determine which profits are truly domestic and which are foreign. As a result, an American corporation can use accounting gimmicks to make domestic profits appear to be earned through an offshore subsidiary and then defer the U.S. corporate income taxes that would otherwise be owed on those profits. The American tech company sells the patent for $1,000 to the subsidiary, and then every month after that the subsidiary charges the American company (its parent company) $1 million for use of the patent. The American company then reports to the I.R.S. that it has little in the way of U.S. profits because it paid out such large royalties throughout the year to the subsidiary in the Cayman Islands. It defers the U.S. taxes on all the income reported by the subsidiary. Of course, the parent company and the Cayman Islands subsidiary are all really operating as one company and owned by the same people, so all of this is an accounting fiction. But it has the effect of shifting profits generated by the product from the U.S. to the Cayman Islands for tax purposes. Nothing has actually changed in real life except that the company now can defer U.S. taxes on the profits that it claims to have earned in the Cayman Islands. There are rules governing “transfer pricing,” which is how parent companies and their subsidiaries effectively charge each other in transfers of property like this. In theory, the rules require that related corporations like the parent company and offshore subsidiary in the example above hold each other at “arm’s length,” meaning they are supposed to act as if they are unrelated companies. If the arm’s length rule worked, then the American parent company in the example would have charged a fair market price when it effectively sold the patent to the offshore subsidiary, and the subsidiary would have charged a fair market rate for use of the patent. The American parent company would have received a much higher price for the patent or would pay less in royalties. Either way, it would not be able to tell the I.R.S. that it had no U.S. profits to report. But the arm’s length rule is fundamentally difficult to enforce. The I.R.S. would have to prove what price the sale of a patent to an unrelated company would fetch, or what the market rate might be for the royalties to use the patent. This is especially difficult when the property transferred is a patent for some new invention, as is often the case with tech companies and pharmaceutical companies. But even companies with fairly traditional products can engage in these same schemes. Caterpillar, a company that most people think of as the quintessential traditional manufacturer, managed to transfer the rights to 85 percent of its profits from selling spare parts to a Swiss subsidiary that had almost nothing to do with the actual business. The arm’s length rule would be even more difficult to enforce under the territorial system proposed by Trump. Because the benefits a corporation could obtain as a result of shifting profits offshore would be even greater under a territorial system, corporations would put even more effort than they do now into abusing transfer pricing rules. Real-life examples of corporate tax dodging are more complicated than the hypothetical example described above, but the bottom line is the same. For example, some offshore subsidiaries used for tax avoidance are not simply a post office box but instead have a small staff. For instance, in 2011, Apple had a staff of 2,452 working in its subsidiaries in Ireland, which was a fraction of its global workforce of 59,000. The problem is that Apple claimed that these Irish subsidiaries generated $22 billion of the $34 billion Apple earned worldwide that year. As one expert pointed out, that would mean that each employee in Ireland generated $9 million in profits in that year alone. In 2012 Apple actually scaled its Irish workforce down to 613 employees. In other words, even if Apple did some real business in Ireland, it was surely shifting a massive amount of profits there from other countries. Another reason real-life examples are sometimes more complicated is that the U.S. does have tax rules that, in theory, attempt to prevent corporations from shifting profits offshore. Most of these rules are in a part of the tax code that experts simply call “subpart F,” which bars corporations from deferring U.S. taxes on certain types of offshore income (like dividends, interest and royalties, for example) that are easy to shift abroad. But Congress and several presidential administrations have drilled so many special exceptions and special breaks into subpart F that corporations are able to easily shift profits offshore, although sometimes they must resort to more convoluted schemes that move the money through multiple countries. In the late 1990s the Clinton administration issued a rule commonly called “check-the-box” because it allows a taxpayer to define an entity as either a branch of a larger company or a separate corporation by checking off the box on a form. This arcane and seemingly inconsequential change unleashed a tidal wave of offshore tax avoidance by corporations because it meant a company could tell different stories to different governments about its profits so that, ultimately, they would be taxed by no government anywhere. For example, imagine an American corporation owns a subsidiary in a European country. The European subsidiary makes a payment to another entity that is located in a tiny country with no corporate income tax (located in a tax haven). The European government is told that the tax haven entity is a separate corporation that is itself a subsidiary, and the payment made to it is an interest payment. The interest payment is therefore deducted from the taxable income that the European subsidiary reports in the country where it is located. Before check-the-box, a payment of interest to a subsidiary in a tax haven would be considered income subject to U.S. taxes with no deferral allowed under subpart F. But under check-the-box, the American corporation tells the American government that the tax haven subsidiary is not a separate entity, but just a branch of the European subsidiary. The payment is therefore an internal transfer of money within a company, so there is no income to report. The end result is that the income is not subject to tax in the European country or in the U.S. And, of course, the tax haven does not impose any tax on it either. The next year, the share of profits that Gilead claimed to earn in the U.S. dropped dramatically. In 2016, even though the company reported that 64 percent of its revenue was generated in the U.S., it reported that just 45 percent of its profits were generated in the U.S. The company seems to be claiming that much of its profits are earned in Ireland, where the formula for its blockbuster drug is supposedly owned by an Irish subsidiary of the company. Irish law allows these profits to be considered earned in the Bahamas, which does not tax corporate profits. This is plainly the result of accounting gimmicks and loopholes given that Gilead makes most of its money by selling drugs in the United States. A territorial system would provide even greater rewards for Gilead’s schemes. Gilead is officially holding $37.6 billion in profits offshore. It has reported that if it repatriates these profits (officially brings them to the U.S.) this would result in a U.S. tax bill of $13.1 billion, which comes to a tax rate of 35 percent. As already explained, when American corporations pay corporate income taxes on offshore profits, they are allowed a credit for any corporate income taxes they have paid to foreign governments. If Gilead reports that it would pay nearly the full U.S. corporate tax rate of 35 percent on these profits upon repatriation, that means that it has paid almost nothing at all in taxes in the foreign countries where it claims it earned these profits. Gilead likely engaged in a transfer pricing scheme in order to defer paying this $13.1 billion in taxes until it brings its profits to the U.S. Under a territorial system, Gilead would be exempt from paying anything ever on these profits, which would be a much greater reward. Most corporations do not publicly state that they are transferring assets offshore to avoid taxes the way Gilead did. But sometimes they drop clues. 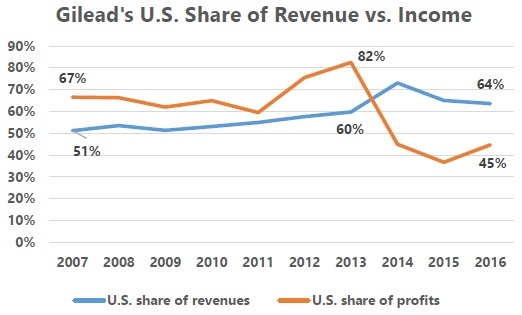 Some corporations, like Microsoft, report to shareholders that a majority of their sales revenue is generated in the U.S. but somehow only a fraction of their profits are generated in the U.S. This implies that they are telling the I.R.S. the same thing, likely using accounting gimmicks to make it appear that their offshore subsidiaries are earning most of the company’s profits. Some corporations reveal how much they would pay in U.S. taxes if they officially bring their offshore profits to the U.S. In addition to Gilead, several companies, including Apple, Microsoft, Gilead, Nike, American Express, Netflix and others have stated that they would pay nearly the full U.S. corporate income tax of 35 percent on these profits. Given that American companies are allowed a tax credit in the amount of any corporate income taxes they have paid to foreign governments, any acknowledgement that they would pay nearly the full 35 percent U.S. corporate tax rate on these profits is a confession that their profits have been subject to almost no taxes in the countries where they claim to have earned them. In other words, these corporations seem to be confessing that they have shifted their profits to offshore tax havens. The total amount of profits that American corporations are officially holding offshore has reached a record $2.6 trillion. Faced with the evidence that much of these profits are characterized as “offshore” only as a result of profit-shifting and tax avoidance, some politicians have claimed that a territorial system is the solution. They argue that by holding profits offshore the companies are responding to the tax rules by locking out money that could otherwise be invested in the United States. At least under a territorial system, they argue, there would be no incentive to keep profits outside the U.S. in this manner. But these profits are not “locked out” of the U.S. economy at all. In fact, in many cases they are “offshore” only as a tax accounting matter. Much, if not most, of these “offshore” profits are already invested in the U.S. economy, and nothing prevents corporations from using them to make investments here. In 2004, Congress provided a special break called a “repatriation holiday” for unrepatriated offshore profits, which failed to boost employment or job creation. (See the box on the following page.) 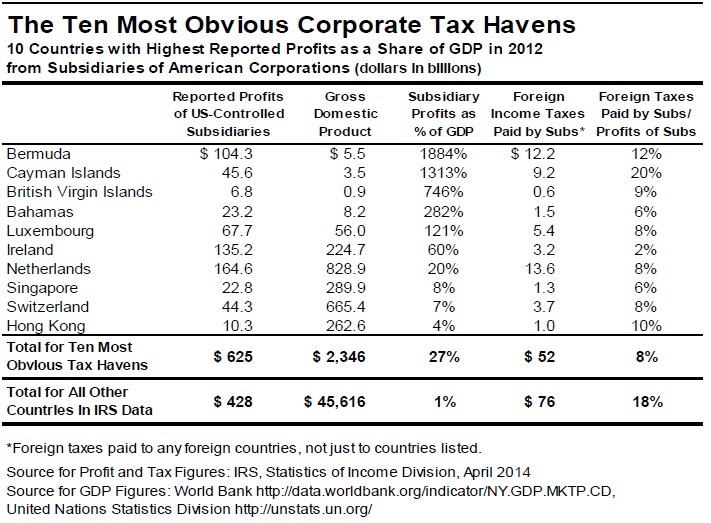 A December 2011 study by the Senate Permanent Subcommittee on Investigations surveyed 27 corporations, including the 15 corporations that repatriated the most offshore cash under the 2004 law, and concluded that in 2010, 46 percent of the profits officially held offshore by these corporations were actually invested in U.S. assets like U.S. bank deposits, U.S. stocks, U.S. Treasury bonds and similar investments. In other words, U.S. corporations are free to invest their funds in the U.S. economy. The only real restriction on this money is that the corporation that is officially holding it offshore cannot use it to pay dividends to shareholders or invest in domestic operations without first paying U.S. tax that is due upon repatriation. But this is not so much a restriction as a requirement that the corporation pays the tax that is due, which is reduced by an amount equal to whatever the corporation has already paid to the government of the foreign country where the profits are said to be generated. In other words, the effect of American corporations officially holding profits “offshore” in this manner is not to lock the money out of the economy but simply to allow the companies to avoid paying taxes. The solution must involve blocking the gimmicks that allow corporations to shift profits offshore rather than rewarding those gimmicks with a more generous tax break, which is what a territorial system would essentially do. Trump, like other proponents of a territorial tax system, argues that it would “level the playing field for American companies.” The reality is that a territorial tax system would favor multinational American corporations over American corporations that are mainly domestic because it would provide the former with more tax avoidance opportunities that are not available to the latter. To the extent that it would influence decisions about the location of actual business operations and jobs, a territorial system could favor the creation of jobs offshore rather than here in the U.S. Proponents of a territorial system argue that the current rules punish American corporations for investing offshore by imposing U.S. taxes, on top of foreign taxes, on the profits that are generated offshore. As has already been explained, this is largely mitigated by the foreign tax credit, which allows American corporations to reduce the amount of U.S. corporate income tax due by the amount of corporate income taxes they have paid in the countries where their offshore profits were generated. For example, if a corporation repatriates profits to the U.S. and is not eligible for any other breaks in the U.S., it must pay 35 percent of those profits in U.S. corporate income taxes if no corporate income taxes were paid in any other country. However, if the company already paid 25 percent in the country where it generated the profits, then it has to pay only 10 percent in the U.S. But proponents of a territorial system argue that this residual U.S. tax is unfair and makes American corporations less able to compete with companies from other countries. This is often connected to an argument that the statutory corporate income tax rate of 35 percent in the U.S. is too high and overly burdens American multinational corporations. The repatriation holiday also provided the greatest benefits to the worst corporate tax dodgers. Most countries with developed economies and real business opportunities have some sort of corporate income tax, which means that American corporations investing there do not pay the full U.S. corporate tax rate of 35 percent when they repatriate profits from those countries. But when American corporations shift their profits to tax havens, which are mostly tiny countries with no corporate income tax or a very low corporate income tax, they are required to pay the full U.S. tax when these profits are repatriated. Corporations using offshore tax havens therefore have much more to gain from a repatriation holiday than a corporation making real offshore investments in a country that offers real business opportunities. The territorial tax system proposed by President Trump is essentially a permanent version of the 2004 measure. No one should expect the results to be better than they were in 2004. The evidence, however, does not demonstrate this. Most U.S. corporations pay far less than 35 percent in federal corporate income taxes even on their domestic profits because so many special breaks and exclusions reduce what they effectively pay. This was the conclusion of a recent ITEP study examining the Fortune 500 corporations that were profitable each year from 2008 through 2015. The same study also further examined the subset of companies reporting significant offshore profits (meaning at least one-tenth of their profits were reported to be earned offshore.) Most of these companies paid a lower effective income tax rate to the U.S. on their domestic profits than they paid to foreign governments on their offshore profits. This seems to indicate that for the most part, other countries are not offering dramatically lower taxes than the U.S. when American corporations invest abroad. The real problem seems to be a limited number of countries that do not tax corporate profits at all or that allow profits to be routed to those countries where profits are not taxed at all. In other words, the handful of countries that serve as offshore tax havens, which encourage accounting gimmicks and profit-shifting but seem to attract little real investment in their economies, are the real crisis in our international tax system. A territorial tax system would only worsen this crisis. So long as there are countries with a zero percent corporate tax rate, the U.S. will always have a higher tax rate than them. American corporations will always shift their profits to the offshore tax havens if they can. This is true even under the tax proposal that the Trump administration released in April, which would set the corporate income tax rate at 15 percent. No reduction in the corporate tax rate can bring it lower than zero. Under Trump’s proposed 15 percent corporate tax rate and territorial system, American corporations will be able to obtain significant savings (equal to up to 15 percent of their profits) by shifting profits to a tax haven like the Cayman Islands or Bermuda. To the extent that tax rules influence where real investments are made and where jobs are located, a territorial system could disadvantage American workers. If another country with investment opportunities really does provide a lower effective tax rate than the U.S., an American corporation could choose to move production to that country. Our current rules place a check on this incentive by imposing at least a residual tax on the resulting offshore profits when they are repatriated to the U.S. Under a territorial system, there would be no such check on this behavior by corporations because there would be no U.S. tax on the offshore profits. Indeed, those who argue that the current system hurts competitiveness have provided weak examples to support their case. For example, after Senator Rob Portman of Ohio became chairman of the Senate’s Permanent Subcommittee on Investigations, he held a hearing titled “Impact of the U.S. Tax Code on the Market for Corporate Control and Jobs.” Much of the hearing focused on Valeant Pharmaceuticals and its ability to acquire American drug companies because, it was argued, the Canadian tax system that applies to Valeant is less burdensome than the U.S. tax rules that American corporations must comply with. The striking thing is what the hearing left out: Valeant is not truly a Canadian corporation at all but rather an American corporation using a particularly egregious loophole to characterize itself as a Canadian one. In 2010, Valeant underwent an “inversion,” which involves an American corporation merging with a foreign one and then claiming that the resulting corporation is based offshore for tax purposes, even though the owners of the American partner to the merger still own most of the newly merged entity. Addressing this certainly does not require anything so dramatic as a shift to a territorial tax system. It requires changing the U.S. tax laws so that an American company cannot claim it has become a foreign one if a majority of its ownership is unchanged or if it is still managed and controlled from inside the U.S. Some proponents of a territorial tax system point out that most other developed countries have long since adopted it and point out that the United States is one of the few countries that still has a worldwide tax system. It might seem intuitive that if other countries have adopted a particular policy, there must be a good reason for it. But the story is more complicated than proponents let on. For one thing, the distinction between our worldwide tax system and the territorial tax systems of other countries is not as stark as one might think. Most tax systems are a hybrid between the two. Just as the U.S. does not actually tax all offshore profits (because of the foreign tax credit and because of deferral) most countries with a territorial system do not exempt all offshore profits. Instead they have some anti-abuse rules that ensure certain types of offshore profits are taxed or that ensure a minimum tax of some sort is paid on offshore profits. But even with these anti-abuse rules in place, territorial tax systems have proven extremely susceptible to corporate tax dodging. Stories of Starbucks shifting profits out of the United Kingdom and Apple shifting profits from Europe stunned the publics of many countries and created a movement for reform. But the response from governments has not, and cannot, solve the problem entirely. The Organization for Economic Co-operation and Development (OECD) and the G-20 governments began a project in 2012 to prevent “base erosion and profit shifting” or BEPS, which is better known as offshore tax dodging. In October of 2015, the OECD released its action plan to address BEPS, and it consisted of recommendations requiring new legislation, administrative action and treaty amendments to prevent multinational corporations from using accounting gimmicks that shift profits away from countries where they are actually earned and into countries where they will not be taxed. Is it possible that a territorial tax system could be combined with provisions to prevent tax avoidance to produce a functional corporate tax system? This was proposed in 2014, but on close inspection, the plan left many problems unsolved. In 2014, then-Rep. Dave Camp, who chaired the House Ways and Means Committee, released a comprehensive tax reform plan that included a territorial system. His plan maintained subpart F, meaning certain offshore income that is easy to shift from one country to another would be subject to U.S. tax. Aside from modifying subpart F in several ways, the plan would also provide a significant tax break (in the form of a lower tax rate) for offshore income from intangible property used outside the U.S., which would have included most income of offshore subsidiaries of American corporations. * This would essentially continue the practice of taxing offshore income more lightly than domestic income, which is the very core of the problem with our international tax system. The corporate income tax rate in the Camp plan would fall to 25 percent generally and to 15 percent for offshore income from intangible property sold for use or consumption outside the U.S.
Congress’s Joint Committee on Taxation provided an estimate that the international corporate tax changes in the plan would raise $68 billion over ten years. But that depended on an accounting gimmick because it included $170 billion raised from a one-time tax on the unrepatriated profits that corporations were holding offshore at the time of enactment. Of course, this would be a limited revenue source that would not be available to offset the costs of a territorial tax system beyond the first ten years. In other words, even with some very complex provisions that Camp included to prevent offshore profit-shifting, his territorial plan nonetheless would lose hundreds of billions of dollars in revenue. *Martin Sullivan, “Economic Analysis: Camp’s Formulaic Approach Treats Most CFC Income as Intangible,” Tax Notes, March 24, 2014. In releasing its action plan, the OECD noted that that this type of international corporate tax dodging has reduced the combined corporate tax revenue of all countries by between $100 billion and $240 billion annually. The plan includes 15 different actions, some of them mind-numbingly complex. To take just one example, BEPS Action 2 concerns “hybrid mismatch arrangements,” which involve an entity or an instrument that is characterized in different ways by different governments. This can lead to, for example, a payment that is deductible in one jurisdiction being sent to an entity in another jurisdiction where it is not considered income, with the result being that it is taxed nowhere. The action plan recommends specific changes to laws or treaties that require governments to look at exactly what is happening with such a payment and how it is being taxed by other governments. The OECD and G-20 desperately resort to these convoluted rules out of an attempt to avoid a simple truth: The territorial systems, like our deferral system, are unworkable. They require tax enforcement authorities to accept the pretense that a web of “subsidiary corporations” in different countries are truly different companies, even when they are all completely controlled by a CEO in, say New York or Connecticut or London. This leaves tax enforcement authorities with the impossible task of divining which profits are “earned” by a subsidiary company that is nothing more than a post office box in Bermuda, and which profits are earned by the American or European corporation that controls that Bermuda subsidiary. The problems with our tax system cannot be solved by offering even larger breaks for any profits characterized as earned offshore. Congress needs to take a different approach. One approach would be to fundamentally change our tax system by eliminating deferral of U.S. taxes on offshore corporate profits. Companies would still be allowed a foreign tax credit to prevent double-taxation, but would no longer be able to defer U.S. taxes otherwise due on offshore profits. Senator Bernie Sanders has introduced legislation that would make this fundamental reform along with others (like closing the loophole that allows inversions) that would be necessary to block the other routes corporations might take to escape U.S. taxes. This would turn our international corporate tax rules into a true worldwide tax system. While some see this as a dramatic departure from the status quo, it has had some bipartisan support in Congress. Democratic Senator Ron Wyden, who is now the ranking member of the Senate Finance Committee, introduced a tax reform bill in 2010 that would have ended deferral, and three Republican Senators co-sponsored the bill. Donald Trump even included elimination of deferral in the first tax plan he proposed as a presidential candidate, although that plan also included an unrealistic cut in the corporate tax rate, among other tax breaks. Another approach would be to keep deferral but prevent companies from abusing it. This is the approach taken by legislation introduced by Senator Sheldon Whitehouse. It would, for example, end abuse of the “check-the-box” rule described earlier that allows a company to characterize its subsidies in different ways to different governments, telling each government that the other is taxing its profits. This bill would rely on enforcement of the seemingly unworkable “arm’s length” standard, but would undeniably result in a dramatic reduction of offshore tax avoidance by corporations. A third approach would be less ambitious but might be the best that can be hoped for in the short-term from a perpetually gridlocked Congress. Lawmakers could enact legislation that simply blocks the very worst abuses, which members of both parties should be able to agree on. For example, legislation closing the loophole that allows American corporation to use paperwork to characterize themselves as “foreign” companies through an inversion should be bipartisan. There is no possible policy rationale for opposing such a reform. Another common sense proposal introduced in Congress would end deferral for the profits officially held offshore by any American corporation that becomes foreign-owned, either through a genuine acquisition by a foreign buyer or through an inversion. Deferral is a tax break meant to accommodate American corporations, and there is no reason to offer it to companies that are foreign-owned or that declare themselves to be foreign-owned. Lawmakers have a number of other sensible options along these lines. For example, it would be straightforward for Congress to expand subpart F to bar deferral of U.S. taxes on profits reported in the most obvious tax havens. Legislation could direct the Treasury Department to make a list of countries where the total profits reported by subsidiaries of American corporations exceeded the country’s GDP in the past several years. 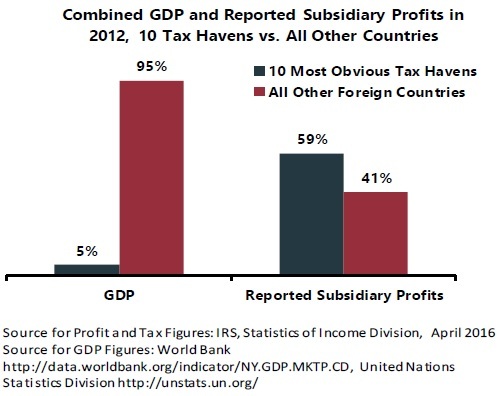 Since any reasonable observer can agree that only accounting gimmicks and tax avoidance can account for the profits reported in these countries, it should not be politically difficult for Congress to deny tax breaks for these profits. There is legislation to accomplish this (to close the loophole allowing inversions), most recently H.R.3434, the Stop Corporate Inversions Act of 2017. S.586, the Corporate Tax Dodging Prevention Act. S.3018, the Bipartisan Tax Fairness and Simplification Act of 2010. S.851, the Stop Tax Haven Abuse Act.